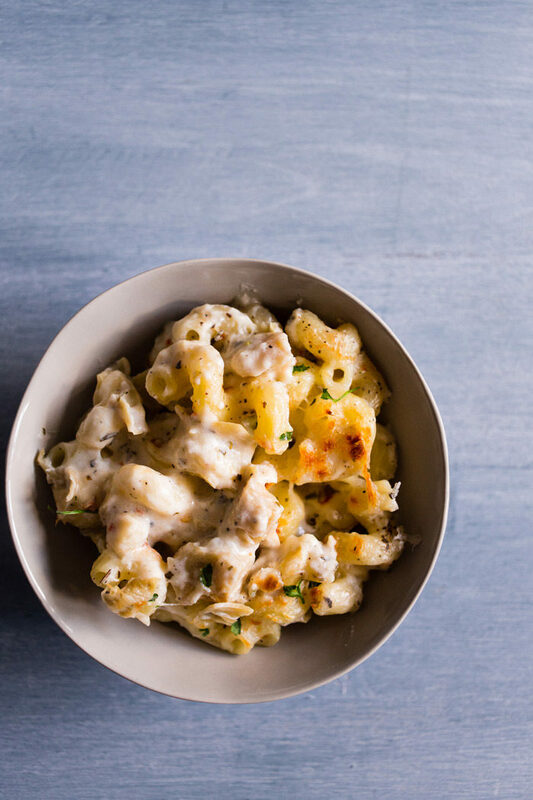 A creamy, rich, and cheesy vegetarian white baked pasta with loads of flavor-rich artichoke hearts tossed in. Just add leftover turkey or cooked chicken for the carnivores! You know how in the middle of winter you crave comfort food? You want to curl into a ball and eat hearty food that warms you to the very core? Well, that has literally never been pasta for me. I KNOW! Normally I’m a beef stew, meatloaf or chili kind of girl. In fact, growing up I rarely even ate pasta. My dad had a weird dislike for pasta and we were lucky if we ate it once a month. Even then if we ate it was always just spaghetti with meat sauce. No baked ziti, no lasagna and never homemade sauce. You guys, I had no idea what I was even missing. Then I moved to New York. Talk about culture and pasta shock! New Yorkers would be happy eating pasta every single day if you let them. I say this with confidence since first family I ever worked for (I used to be a nanny) literally ate some form of pasta every single night. Eventually, I learned to love pasta just as much and realized that pasta can be used in more ways than just spaghetti and meat sauce. Soon I started experimenting with homemade sauces and different ways to bake up pasta. Since I’m from the Midwest, I still have an undying love for casserole so baked pasta speaks to my Ohio heart. In the end, I realized my love for pasta was strong (maybe not as strong as every. single. day.) and I needed to figure out a few ways to jazz up my new pasta loving life. 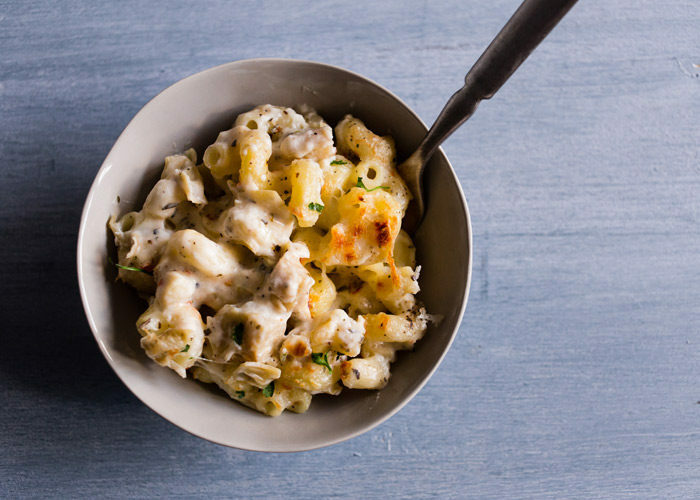 Now, for this Creamy Artichoke Baked Ziti, I went cheesy and full of herbs. I also threw in some chopped marinated artichokes because we all know artichokes rock in pasta. Confession alert: I don’t actually like eating artichokes by themselves BUT throw them in pasta or a warm dip and I’m down! I also love using marinated artichokes because they are already come flavor packed so you’re not losing their flavor in a sea of cheese. Another thing I love about this pasta is that you can really throw in just about anything you love – baby kale, spinach, broccoli, etc. I also opted to keep mine meat free. but I think a few cups of shredded chicken or leftover thanksgiving turkey would be awesome in this bake. Now, I actually made everything you see here in the same skillet, which I think makes it an even better recipe. I added water to the skillet and cooked the pasta in the pan. When it was al dente, I took it out, drained it and set I aside while I made the sauce in the same skillet. Then, I tossed it all together and baked it up in the oven. I love making dishes one skillet because then I don’t have as many dishes to clean up. No one likes doing dishes. Including me! Set a large oven-safe skillet over medium heat. Add olive oil. Once the oil, is hot, add onions and sauté until translucent, about 5 minutes. Add in garlic and sauté until fragrant, about 30 seconds. Add in the milk, half and half, Italian seasoning, and crushed red pepper. Simmer over medium heat until warmed through, but don’t let the mixture boil as you don’t want to scorch the milk. Once the milk is hot, add in 2-1/2 cups shredded cheese and stir to combine. 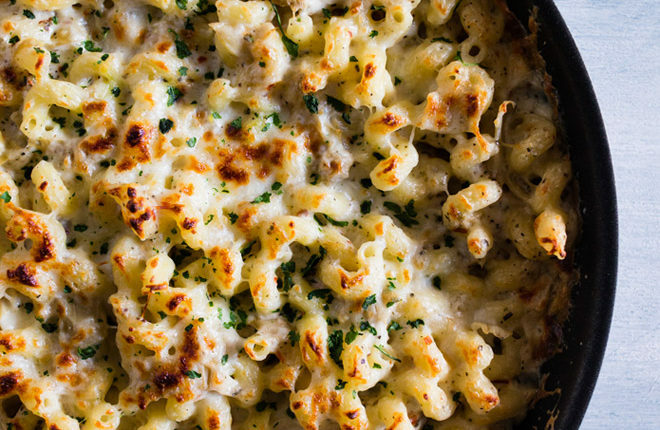 You want the cheese to fully melt in a creamy sauce. Add in the cooked pasta and chopped artichokes and stir to fully combine. Taste the mixture and season with a desired amount of kosher salt and pepper. 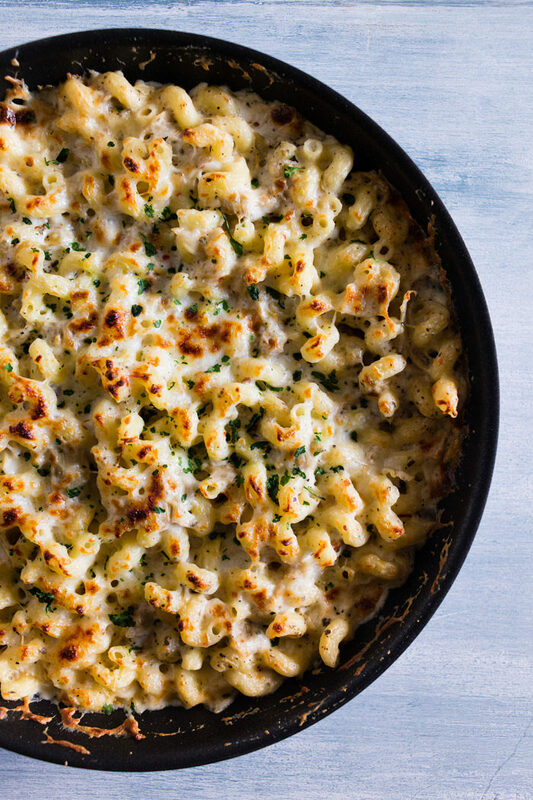 If you do not have an oven-safe skillet, transfer the pasta mixture to an 8-inch by 8-inch baking dish. Otherwise, you can bake the pasta right in the skillet. Top with remaining 1/2 cup of cheese and add to the oven. 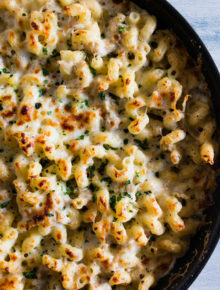 Bake until the top of the pasta is browned and bubbly, 10-15 minutes. Remove from the oven and serve hot. Note: You can also opt to first cook the pasta in the pan with water, drain and set aside. Then make the recipe as written. This helps cut down on dishes. Add cooked, cubed turkey or chicken to the carnivores’ portion before baking. Some smaller casserole dishes or ramekins would work well to keep them separated.